So what exactly was wrong with my leg? What was I born with? From birth, I have this congenital problem called spina bifida, which, in Latin, means split spine. A condition where the bones in the vertebral column do not fully cover the spinal cord, leaving it exposed. In many cases, left untreated, this leads to paralysis as an adult. My right leg is crooked,weak and without any sensation and I have zero balance which also means I cannot stand on my right leg for more than 5 seconds. And there is more. I suffer from severe lower back pain, which if strikes badly – then I go on total bed rest and cannot exercise for 2-3 months at a stretch. But then it also comes when I start doing my exercises and try to run long distances in too short a time. As a kid, I used to wear really heavy iron boots to help me walk, sometimes I would cry nights and sometimes my sister would carry me during the day. My mom would take me from one X-ray clinic to another almost every week, but nothing could be figured out, and there was no cure for this. Though these days there are corrective surgeries at birth, those days doctors had still not understood the problem well. Doctors advised that I get an oil massage done every day for my right leg and start swimming, to make my leg muscles stronger. On doctor’s advice, I wore iron boots to straighten my leg, did oil massages, and joined swimming at an early age. After around 3-4 years, it did correct the leg to a large extent. Today, I don’t need the boots for my leg, but my right foot is still deformed, still smaller, weak, numb and imbalanced. I still walk with a slight limp. I work around my limitations in my everyday activities, so much so, that by now it is almost normal for me. But today, as an adult, what does it mean? I have lived with limitations all my life, and now it is all natural for me. But then people come up often and ask – why am I limping? is my leg ok? I live in excrutiating pain by the mere touch of the lump in my lower back. When I wore iron boots as a kid, my leg would hurt from all the heaviness of it and trying to lift my leg to take the next step. I always have blisters on my right foot, with any shoes (apart from sneakers) if I walk more than 10 minutes. Since this has affected my lower back all the way down to my right leg, I have no balance and zero flexibility. This therefore affects my walking, running, dancing, yoga, everything that involves the legs!! Cannot do any intensive workout. Only sedentary exercises. Else I get severe lower back pain, and 1 month of bed rest. Cannot wear slippers or high heels, or any shoe which doesn’t hold the feet. Since my right foot has no sensation, it needs to have buckles on shoes to hold the shoes together. Not able to wear high heels for a women, is a big thing, . Have tried wearing short platform heels, but it’s highly uncomfortable for me and I could have a bad fall anytime. Also, since the sizes are different, my shoes are always either too tight or too loose for at least one of the foot, so I’m always uncomfortable. If I wear heels for a little longer than 10 minutes, my right foot breaks out into blisters and sometimes bleeds too. Doctors had told me that those suffering from this condition, can get paralysis by the time they get to 30 years and the pains can increase and worsen by the year. So yes, the pains had become more frequent by the year but thankfully I beat the paralysis. Current doctors say that’s probably because of all those years of swimming and being an active sportsperson throughout my school and college days. Over the years, I have learned to accept what can’t be changed and to instead focus on what I can do. I do not let my limitations define me. For example, I have always loved travelling and have traveled extensively, but in recent years I have tried to expand the horizon of my travel experiences. I decided to give trekking a go. So far, I have managed several treks also like Dayara Bugyal, Great Himalayan National Park, Triund, Sirloskar and the most challenging for me – Hampta Pass. A snow-covered pass at 14,000 feet and 5 days of arduous trekking really pushed the boundaries of my body and mind. Three years back, I discovered running. Every time I went out to run, my lower back pained. I was in bed. But whenever I recovered, I went back out to run again. This went on for about 5-6 months, till the pains became less and less frequent. I did my first Pinkathon (10K) in 2015. And since then I have not looked back. But hey, you might say, running involves the legs too!! Yes I know. I said I discovered running, and became a runner. But I didn’t say I run fast. My runner friend Tanya (who motivated me to write this blog) and I held each other through my last 4 kms of my first half marathon. I marvel in the satisfaction that I can run for 3 hours without injury to my back and can finish a race. There was a time when taking my next step just to walk was such a herculean and painful task for me. To be able to run now, I feel sky is the limit. I beat the disease, before it could paralyse me!! And I could not have done it alone. As I age, I feel a stronger sense of gratitude each passing year for all the people around me. My family, my sisters, my running buddies, my friends – people who support and encourage me, people whom I laugh with, play with and live my life with. Even today, I get my spina bifida attacks, but they come just once a year. And the rest of the year, I am running, swimming and clowning around! Because Life is what we make of it! Do share this article with a near and dear one who is in dire need of motivation to make her first step no matter how painful it will be in the beginning. Wow Punam, this is truly inspiring! 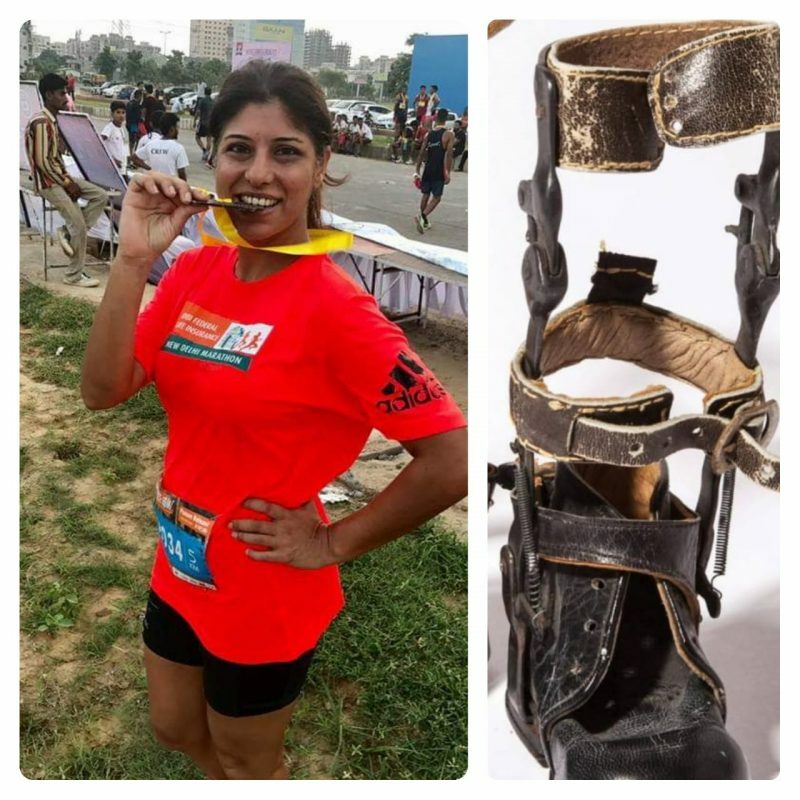 Hats off to you and may you never look back and keep running, trekking or any other sport you want to try your legs on ! You are A.M.A.Z.I.N.G, lady! Salutes!